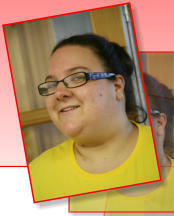 Volunteer Support Facilitator jennie’s Chuckles 1) If you were a superhero or villain, what would your superpower be? I would be able to produce storms from my hands like storm from X men. 2) If you were at a karaoke bar, what song you sing? " Don’t stop me now" by Queen. 3) What is your idea of perfect happiness? My children’s happiness is all that matters to me. 4) Why do you love to Chuckle? Because it makes me feel good. 5) What is your most treasured possession? My children and dogs.